Rotating tires according to the maintenance messages on the information display*/ driver information interface* helps to distribute wear more evenly and increase tire life. Rotate the tires as shown here. Tires with directional tread patterns should only be rotated front to back (not from one side to the other). 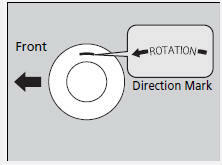 Directional tires should be mounted with the rotation indication mark facing forward, as shown below. Whenever tires are rotated, you must calibrate the TPMS.